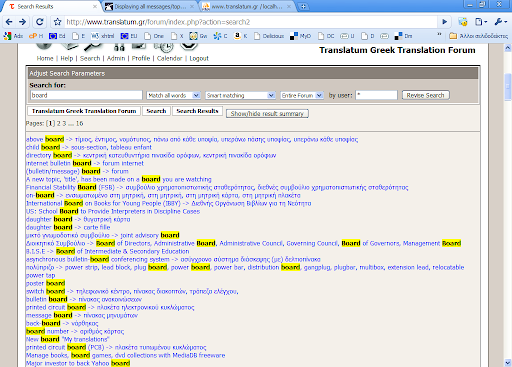 For terminology search, we highly recommend using the Magic search option from the Translatum tools tab on the left. When using the search on top of the forum from the forum index page, the whole forum is searched; when using it from within a specific board, that specific board is searched; when using it from within a specific topic, that specific topic is searched. As most of you might have noticed, there is an ongoing effort to add translations in the topic titles (the first post of a topic). Why is this so? So that you can search the forum in the same way you would search a dictionary. How is this done? You click on the Search button and then you select the box Topic subjects only. The results will only come from words contained in topic titles. You can further restrict the search by selecting the most relevant boards, i.e. English-Greek and Greek-English. Also, the members glossary board might be a good place to search (although you will need to do a full search and not Topic subjects only). Therefore, I urge you, when an appropriate translation is found, to add it in your topic title. Note, that this should be done only in the actual topic title and not in the subsequent answers' titles, as the search engine looks up only the topic titles. This can be done either by the actual poster or a moderator. Another trick is to use quotation marks that when you are searching for a phrase. The use of quotation marks bypasses the error when single characters are contained in the search phrase (i.e. the word "a"). The search has been modified. Now, when you search you will see a list with subjects of hits highlighted. Clicking on them will scroll down to the topic.